Economic deceleration, industry restructuring, and new energy and environmental policies have slowed the growth of coal consumption in China and are also driving more centralized and cleaner uses of coal. After nearly a decade of rapid growth, energy-based consumption of coal, which currently supplies two-thirds of China's overall energy use, grew only 1% to 2% in 2012 and 2013 and was essentially flat in 2014. Total energy consumption in China has slowed as its economic growth has eased and as the composition of gross domestic product (GDP) has shifted. 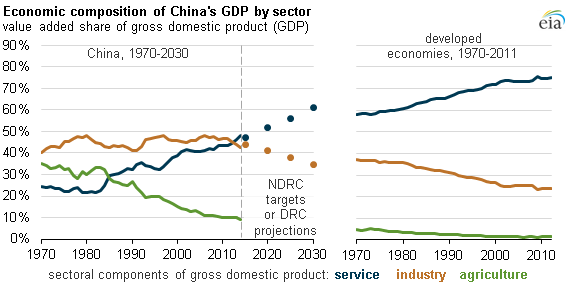 In 2013, the service sector share (47%) of GDP surpassed the industry sector share (44%) for the first time in Chinese history. The service sector share increased to 48% in 2014, already exceeding the government's 47% goal for 2015. Policies to accelerate the development of service industries are likely to sustain the transition away from industry, especially heavy manufacturing. 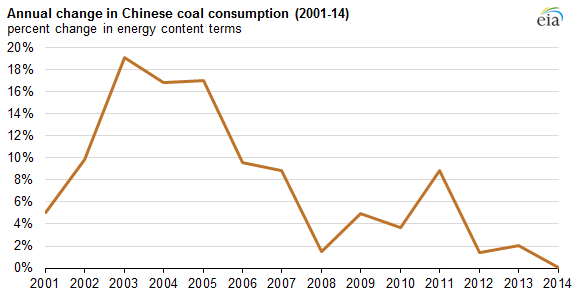 As heavy manufacturing becomes less prominent, growth in coal consumption is expected to weaken. Note: Shares are based on nominal dollars. Developed economies based on UN definition. Industry restructuring has reduced energy demand growth from coal-intensive industries such as steel, cement, and fertilizer as industry growth slows and processes become more energy efficient. The Made in China 2025 blueprint unveiled by the State Council in May 2015—China's first action plan to modernize manufacturing through information technology and other innovations—could accelerate reductions in energy intensity and changes in energy consumption patterns, if successfully implemented. Coal use is likely to be even more concentrated in large and more efficient energy conversion facilities, mainly power and heat generation plants, as scattered, inefficient, and highly polluting small coal boilers are phased out. Coal directly burned at industrial facilities accounts for more than 20% of the coal consumption in China (compared with less than 5% in the United States), suggesting significant potential for reduction. China's severe air pollution challenges have led to new policies and regulations to restrict coal use in coastal China, to upgrade the nation's coal-fired power generation fleet, and to accelerate the increase of alternative energy technologies. In particular, strict standards for existing and new coal-fired power plants require the adoption of advanced coal technologies. Another action plan aims to reduce coal consumption in absolute terms in four nonpower industries. China's Energy Development Strategy Action Plan (2014-2020) sets binding caps—at absolute levels for the first time—on annual primary energy and coal consumption until 2020. It also specifies targets for reducing coal's share in primary energy consumption to 62% and for increasing nonfossil energy's share to 15% by 2020 and to 20% by 2030. Despite changes in China's coal consumption patterns and the likely decline of coal's share of the energy mix, the long-term use of coal depends on the country's future energy demand. Even with weaker economic growth, coal consumption could continue to grow until sufficient alternatives can economically serve China's energy needs.